We provide internally defect free, machinable and long lasting heavy castings to enable our customers to deliver their projects timely with reduced machining cost at only slight premium over general casting cost. We are a Cast Iron Jobbing Foundry producing raw & machined castings required in various Industries. We have two plants with 500 tons/month capacity. Both our plants are located in Kolhapur area. Kolhapur is convinienlty locatd from many prime cities. It 400 Km from Mumbai, around 240 Km from Pune, 600 Km from Bangalore & 540 Km from Hyderabad. The Foundry is manned by qualified and trained staff and workers. 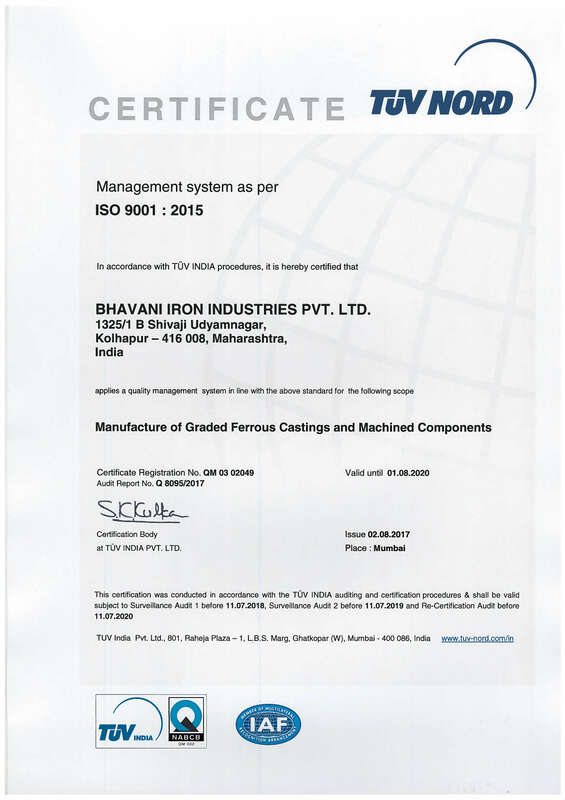 The Company has acquired ISO9001:2015 accreditation. We manufacture graded Cast Iron Casting weighing from 200 to 7000 Kgs . We can also arrange an external pattern-maker as per requirement. We have two big VMC machines to machine our casting. Cement, Coupling, Die makening, Electrical, Foundry tooling, Machine tool (CNC, VMC, SPM etc. ), Match plates, Material Handling, Packing, Pattern making, Press tool, Power Plant, Printing, Pumps, Sugar, Testing machinery, Valves. Grades: FG-200, FG-220, FG-260, FG-300 and Low alloyed cast iron. Moulding: CO2 and Nobake process with sand reclamation unit.